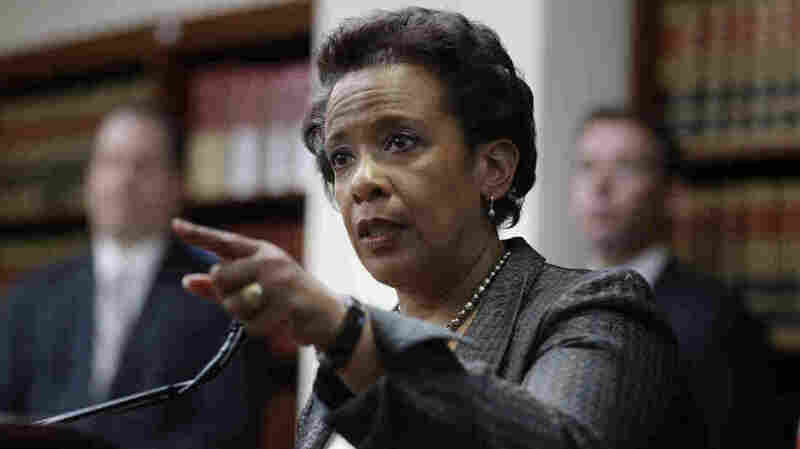 Brooklyn Prosecutor Could Be Nominated Attorney General In Coming Days Loretta Lynch is the lead federal prosecutor in a district of 8 million people. But outside law enforcement circles, she isn't widely known. She'd be the nation's first black female attorney general. Loretta Lynch has handled or supervised a wide range of cases including New York police brutality against a Haitian immigrant, a $45 million cybertheft involving ATMs and the ongoing fraud prosecution of Republican Rep. Michael Grimm of New York. Two sources familiar with the process tell NPR that Loretta Lynch, the top prosecutor in Brooklyn, could be nominated by President Obama as attorney general in the coming days. Lynch is the lead federal prosecutor in a district that serves 8 million people. But outside of law enforcement circles, this daughter of a preacher is not widely known. Friends say that's because Lynch prefers to let her cases speak for themselves. And let's start with this one: a violent sexual assault against Haitian immigrant Abner Louima back in 1997. Prosecutors called that case one of the worst acts of police brutality in New York City history, and a central figure in the attack, Justin Volpe, was sentenced to 30 years in prison. Lynch, a graduate of Harvard Law School, worked her way up the ladder in Brooklyn, a huge office that handles everything from old-school Mafia busts to new forms of cybercrime. Here's Lynch talking last year about a $45 million ATM robbery. "This was a 21st century bank heist. But instead of guns and masks this cybercrime organization used laptops and malware," she said. More recently, Lynch made a splash for indicting a Republican congressman from Staten Island on fraud charges. That lawmaker, Rep. Michael Grimm, once worked as an undercover FBI agent — an irony Lynch pointed out at a news conference. "Michael Grimm made the choice to go from upholding the law to breaking it," she said. Grimm, who was re-elected Tuesday, has pleaded not guilty. That's not the only politically sensitive case on her docket. Brooklyn prosecutors are also investigating money-laundering allegations against an ally of Russian leader Vladimir Putin, the Wall Street Journal reported. If she's selected by President Obama to lead the Justice Department, Lynch would become the first African-American woman to serve as attorney general. She was born in Greensboro, N.C., in 1959, a year before black students there sat down at a whites-only lunch counter and helped catalyze protests around the country. Students like Ezell Blair Jr., who remembered that era with NPR. "But I was prepared that if I was going to die, then I'm going to die here taking my stand for what I believe to be right and true," Blair told NPR's Tell Me More. In a speech two years ago, Lynch said her father opened his church to students as they planned their boycotts. He carried her, a toddler, to those meetings "riding on his shoulders." One of Lynch's brothers is a minister, carrying on a sort of family tradition. Another, she told the audience in New York in 2012, is a Navy SEAL "like no other." The U.S. Senate has twice confirmed Lynch to be the top prosecutor in Brooklyn, once in the Clinton years and again in 2010, by voice vote, for Obama. In between, she worked for a law firm, but she never fully walked away from public service. One of her assignments: investigating crimes for the International Criminal Tribunal for Rwanda. In the 2012 speech, Lynch described hearing the story of a woman who survived an attack by hiding in a churchyard "under a pile of dead bodies." That work was an opportunity, Lynch said, to serve people and repay the gift of their trust.